UCLA Football played their regular season finale at home Saturday night against California, completing their first undefeated season on its home field since 2005, becoming bowl eligible all in one night with a 30-27 victory over the Golden Bears. UCLA quarterback Josh Rosen possibly played his final game at the Rose Bowl if he forgoes his senior season to enter the NFL draft, which is expected. Rosen completed 13 of 18 passes for 202 yards in the first half, connecting with Jordan Lasley and Theo Howard for scores, giving him 59 touchdowns for his career, as he also finished only 283 yards shy of 4,000 yards for the season. The star quarterback however, was sacked three times on the night; each hit seemed to be worse than the last. The most brutal of them all, came by Cal’s Alex Funches late in the first half, where he sent Rosen to ground, landing viciously on his right shoulder and neck. Rosen remained in the game for three more plays but ultimately would not return in second half, showing frustration, as he slammed his helmet to the ground on the sideline. Coach Jedd Fisch wouldn't fully speak on the injury at hand but did relate his decision to sit Rosen in the second half for precautionary reasons. Devon Modster took over for the Bruins at quarterback, as the team rallied behind the redshirt freshman, as he found out he’d be starting the second half at halftime. “It was definitely a great experience, but I wouldn't wanna experience it with any other people besides my teammates right now,” said Modster who completed 14 of 18 passes for 191 yards and drove the Bruins down the field to set up J.J. Molson's 37-yard game-winning field goal. Modsters arm strength was on display midway through the third quarter, as he connected with Jordan Lasley for 37 yards, followed by another beautiful strike to Eldridge Massington for a gain of 16. Running back Brandon Stephens then finished the six play, 58 yard drive with a one-yard touchdown run for the Bruins, putting them back on top 24-17. 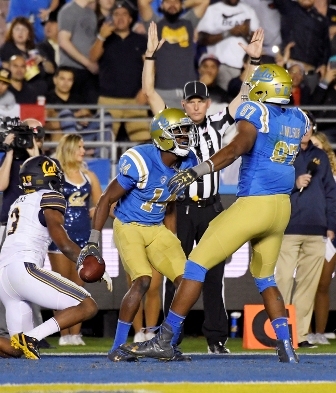 Jordan Lasley set career highs with 12 receptions for 227 yards and a touchdown for the Bruins, as the junior walked out on senior night with his teammates before the game, raising some questions as if he may be declaring his name for the NFL draft. With 2:22 to play in the fourth quarter, Cal receiver Jordan Veasy caught a 6-yard touchdown pass from Ross Bowers, making the score tied at 27-27 all, but the Golden Bears ultimately fell just short surrendering the Bruins their fifth bowl appearance in five of their last six seasons. UCLA will play their last game of the season at the Independence Bowl in Shreveport, Louisiana on Dec. 27 with an opponent to be decided.